The popular mythology of the American mountain Man, represesented in countless paintings, statues, re-eneactment groups, special interest magazines and, sometimes. movies presents a distinct stereotype. He is rugged,dour, stoic, a superb huntsman / trapper,definitely a loner (except for occasionally working with or meeting up with other similar types, usually at winter quarters. He is at home in the natural environment which provides most of his needs: food, fuel, clothing. Money is of little apparent interest to him, nor are women, let alone children. He seems to frequently engage in vicious encounters with grizzly bears. When bears aren't hunting him, bloodthirtsy Indians chase him. His family background is obscure but he's certainly not from the effete eastern states.His education usually appears to be rudimentary. A Trappers equipment in such cases is generally one Animal upon which is placed...a riding Saddle and bridle a sack containing six Beaver traps a blanket with an extra pair of Moccasins his powder horn and bullet pouch with a belt to which is attached a butcher Knife a small wooden box containing bait for Beaver a Tobacco sack with a pipe and implements for making fire with sometimes a hatchet fastened to the Pommel of his saddle his personal dress is a flannel or cotton shirt (if he is fortunate to obtain one, if not Antelope skin answers the purpose of over and under shirt) a pair of leather breeches with Blanket or smoked Buffalo skin, leggings, a coat made of Blanket or Buffalo robe a hat or Cap of wool, Buffalo or Otter skin his hose are pieces of Blanket lapped round his feet which are covered with a pair of Moccasins made of Dressed Deer Elk or Buffaloe skins with his long hair falling loosely over his shoulders complete the uniform." Marie Dorion image and memorial plaque. 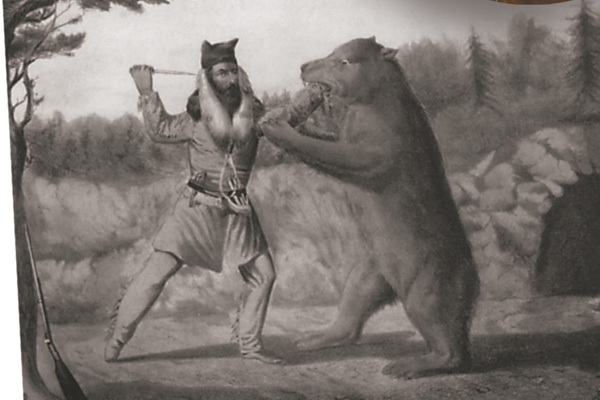 "The Trapper's Bride" -1837 painting. The bride cost the trapper $600 in trade good, an enormous sum in today's money.This suggests the socio-cultural value as well as the monetary value mountain men placed on wives. In 1810 Frontiersmen like Glass usually relied heavily on the help of others. 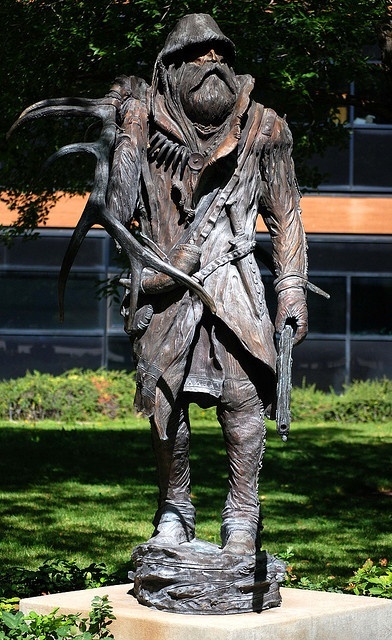 These included their hunting and trapping companions, to whom they owed and were owed commercial obligations under partnetship agreements, and local Indians, with whom they had an uneasy relationship, being both competitors and collaborators in the harsh environment in which both races made a living. But perhaps most important - and usually overlooked - was the essential role of women -especially Indian women - in the life of the frontiersmen. To its credit, The Revenant does acknowledge this aspect of frontiersman lifestyle, although rather cursorily. A few frontiersmen took European wives but for years there was a shortage of such females in this part of the America. Besides, Indian women were a much better option. They had been raised in a rugged lifestyle from birth, and were acccustomed to the terrain and dangers of mountain life. Tragically, this proved to be of little use in preventing them later warding off European-introduced diseases such as smallpox and measles. They had invaluable knowledge of local conditions. Thier knowledge of local vegetation and its uses as food, seeds and medicine was invaluable. Indian women were proficient in processing pelts and furs for market. They were also admired for their proficiency in interpretation and translation -essential for bargaining and communicating with local tribes. In turn there is some evidence that for some Indian women becoming a wife / partner to a mountain man / frontiersman offered an improved, less restrictive lifestyle in which their contributions to the partnership wererecognised and valued. One of the earliest -and the famous - of these Indian wives was Sacagawea, who became the wife of Toussaint Charbonneau, the interpreter for Lewis and Clark's Corps of Discovery to the far West . The couple's infant son Jean Baptiste went along with them and at the end of the eepic journey was adopted by Clark. But there were many other examples of Indian women who partnered frontiersmen of that era. For example, Marie Dorion,[ born c.1876?] a member of the Iowan tribe, who seems to have become a youthful convert to Roman Catholicism and who as a teenager married Pierre Dorion, son of a French-Canadian and whose mother was a South Dakota Sioux. Dorion was a fur trader and Marie accompanied him on his trading expeditions in a huge area that included what is now North and South Dakota, Missouri, and Nebraska. In 1810 the couple, with two young children and another born the next year) went on the Hunt expedition, which tried to find an overland route from Missouri to Oregon County, and also identify locations for fur trading posts along the way. She seems to have walked most of the way. 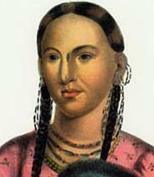 In 1814 a series of Indians attacks left her husband and his companions dead. She headed west with her children, trampling through snow drifts and blizzards for a couple of months until she was rescued by Walla Walla Indians and she and her children eventually reached the safety of Fort Okanogan in what is now Washington state. 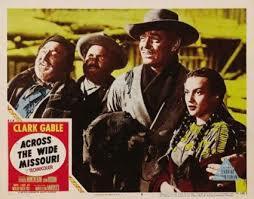 The early 1950s-era Across the Wide Missouri (directed bt William Wellman, who disowned it after it was hacked to pieces by the studio, was decades aheasd of its time in the use of real Indians as actors, and authentic use of Indian languages, as well as its depiction of the crucial role played by local tribes in the European mountain frontier hunting-trapping economy. 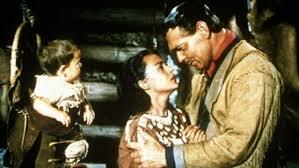 And its portrayal of the loving partnership between a frontiersman (Clark Gable) and his Indian wife is now supported by historical research. Richard J. Fehrman published a valuable statistical analysis of the mountain men in Vol. 10 of the Mountain Men Series, edited by LeRoy Hafen (and also cited by Eddins). Fehrman analysed 292 biographical sketches of mountain men who appeared in the ten volume series. His account disproves most of the commonly-believed beliefs about these men. * Despite the view perpetuated by movies, magazines and novels, only a few mountain men were killed by grizzly bear attacks. * Fellow humans were much more dangerous than bears: 11% of the survey were killed by Indians, and another 7% bu non-Indians. * Despite the popular portrayal of mountain mern's lives as nasty, brutish and short, most mountain men died in their beds of old age-related illnesses and diseases In a period when white U.S. males were lucky to live beyond thirty, Feynam's survey suggests that the median age of mountain-men's death was sixty-five. * most were literate and a surprising number wrote journals and memoirs. * most seem to have taken a keen interest in the commercial side of hunting and trapping, and frquently participated in business partnerships or joint ventures. * Despite the common perception that the mountain men were (a) loners and (b) avoided the company of women, in fact 226 of 268 men [84%] whose marital status is known, were married. * 140 of these married men [62%] married white women; 63 [28%] married Indian women and 23 [10%] married both whites and Indians. *Almost one-third [31%] were foreign-born, not born-and-bred Americans. Half of these were Canadian. The rest came from the British Isles and Europe. * Missouri, Kentucky and Virginia suipplied the majority of the US-born contingent. *most of the married mountain men, [75%] far from being isolates, were family men with children - an average of three to four per family. And most of these were born in wedlock.Most trappers had one wife, and the average length of marriage was fifteen years (a considerable period in those days of high mortality rates). Second marriages also averaged fifteeen years. * Mountain men, far from being alone, were usually accompanied in the western wilderness by wife and children, with the wives playing a crucial part in assisting with trapping and treating furs and pelts. Some wives even intervened in fights, brawls or attacks in order to protect their husbands. 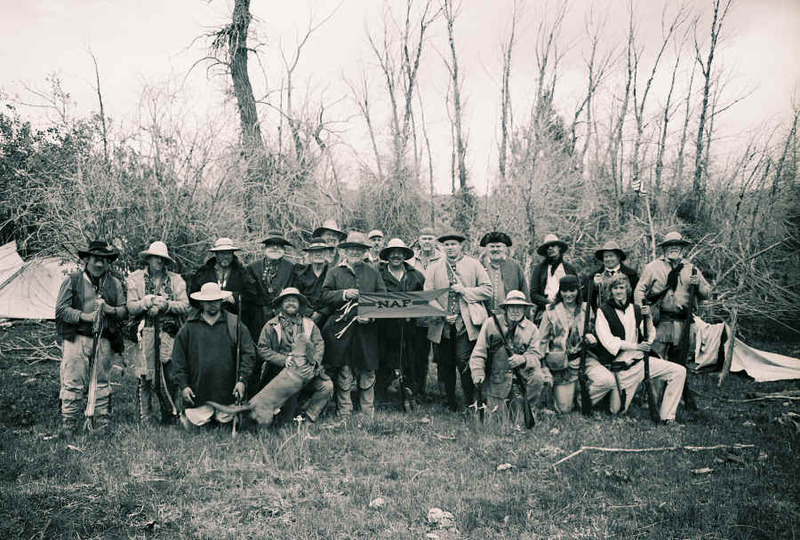 * For most mountain men there was a life beyond hunting, trapping and trading.They often acted as guides to the U.S.military and / or wagon trains of settlers moving to California or Oregon. Many eventually turned to farming or ranching, often in California, Oregon or Missouri. In brief,despite the myth, they reurned to "civilisation" rather than avoiding or rejecting what it offered.